Axis is working with Birmingham Housing Dept & Touchstone Housing Association on this project. Chatham Road involves the demolition of the majority of existing Smiths housing, with the retention of 14 dwellings. Approximately 65 dwellings will be new build with a mixed tenure allocation, whilst a 60 bed Extra Care scheme is also planned on the site. The proposals incorporate a new road layout including a Home Zone link from east to west which the residents are keen to see happen. 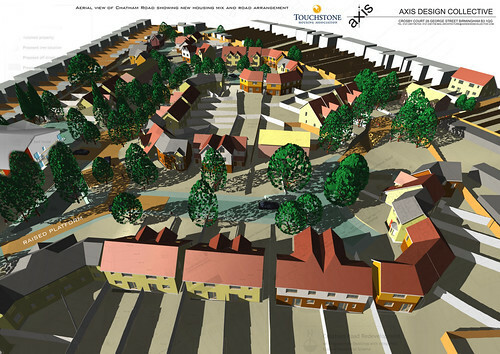 During the consultation process Axis Design took the decision to present the scheme through computerised 3D modelling, a process that residents have traditionally treated with caution. However the Chatham Road residents and local EDG embraced the results because the facility for multiple viewpoints helped communicate the scheme to the wider community, even down to showing the views from your own front window and flying through it to visit your neighbours!